The last salutation and description may be most unsettling. Why, one may ask, do we use military terms for anything associated with our gentle Queen? In fact, there has been a long history of association of Our Lady with military campaigns. During the sea battle of Lepanto and the battle that lifted the siege of Vienna, Our Lady was invoked by the Catholic forces who witnessed outstanding victory over enemy forces under impossible circumstances. These two critical battles saved the Christian West from falling into the hands of invading Muslim forces. In recent times, the Argentine Army regards Our Blessed Mother as their spiritual Commander-in-Chief. That did not, however, help them recapture the Malvinas, better known as the Falklands, from the English. Perhaps, the strangeness comes with the collective amnesia of Catholic Tradition. Military terms, in fact, are not new in the Church. Indeed, it used to be quite common, before the advent of political correctness, to call the Church on earth “The Church Militant” to distinguish living Catholics still struggling to earn salvation from the “Church Suffering” in Purgatory and the “Church Triumphant” in Heaven. So, when Frank Duff began his voluntary group of laymen to assist the work of the Church Militant, the term “Legion of Mary” was a natural choice. Today, talk of Church Triumphant and even Church Militant can be embarrassing. We have decided to bury them in the closet of all things considered “pre-Vatican II”, the catch-all phrase that referred to everything which is considered to be a burden of the past which must be expunged and purged from the Church in order to save it from rot. One of the main objections hurled against the pre Vatican II milieu is that the Church was guilty of triumphalism, a sense of superiority over other religions and ideologies, which led to bloodshed and violence. But is this true? Is the Church guilty of such triumphalism? I believe we need to avoid reducing everything to the lowest common denominator. There are different manifestations of triumphalism, but they can be largely divided into two categories. A triumphalism which is solely based on delusions of grandeur, a personal sense of superiority or “Proud to be Catholic” emblazoned on the front of our T-Shirt. This is a triumphalism that is based on arrogance and can lead to hate. Then, there is a triumphalism which is based on the Truth. Would it be triumphalistic to award the gold medal to the one who finished the race first or confer the school’s principal honour on the best performing student? No one would accuse these exercises as triumphalistic because they merely reflect the Truth. Likewise, the Church does not boast that she has the fullness of divine revelation and that she is the ordinary means of salvation, if they were not true. If the fullness of Truth subsists in the Catholic Church, that should not make us haughty, but humble. The fact that Our Lord has chosen us as the primary and ordinary vehicle for both his message and mission of salvation should drive us to our knees, because as a Church made up of individual unworthy sinners, we can take no credit for this. Rather, this truth should propel us to commit ourselves with greater zeal to the mission that has been entrusted to us. Christ is the greatest Victor as he announced that he has “overcome the world” (John 16:33). What’s more, the faithful share in His triumph. And let’s not forget that the Blessed Virgin is rightly called Our Lady of Victory. But the greatest trophy which we boast of, is that Christ's Resurrection was a triumph over death. The substance of the Cross and Resurrection is the triumph of this truth, without which, belief in a Resurrection becomes a mere nebulous, ungrounded, and unsustainable hope. St. Paul argues that any denial of the resurrection would involve logical inconsistencies. If there is no such thing as bodily resurrection, then Christ has not risen. The consequences for us are grave: both forgiveness of sins and salvation are illusions. Our faith would be in vain. Today’s feast wreaks with the sweet odour of triumphalism! This feast strengthens us through faith in the future resurrection, not just of the soul but also of the body. In looking to Our Lady, carried up amid the rejoicing of angels, human life is opened to the perspective of eternal happiness. Our own death is not the end but rather the entrance into life that knows no death. The assumption of our bodies, prefigured by Christ in his own power and also in Mary by the gift of God, will one day be our gift too. Taken up into heaven, Mary shows us the way to God, the way to heaven, the way to life. 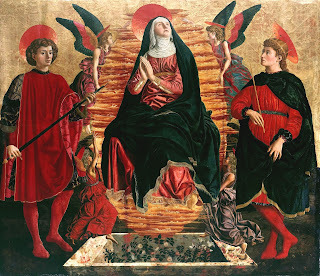 Here in the Assumption of Our Lady is living proof that our triumphalism over sin and death is not merely based on delusions of grandeur or neurotic denial of death, but firmly grounded on Truth. Our blessed Mother provides us with the necessary corrective to the idea of Triumphalism exhibited by the Church. Just like Mary, we are called to be gentle and docile proclaimers of God’s Triumph, not through our own merits or efforts, but always through providential grace of God. The Church stands with Mary, not as a belligerent bully, but as a convincing witness of faith that God will prove triumphant even in the midst of human failings and sin. There is an oppositional quality to our faith, the recognition that in knowing what we stand for, we also know what we stand against. We have been placed in the midst of a fallen world, not merely to surrender to its failure to love, but to live in defiance to that which opposes God. Resist we must, but to do so, we attempt to imitate, not the fallen powers of this world, but Christ the Lord, who wrested power away from the powerful, not by force of arms, but in the strength of his will to love us unto death. Christ’s definitive victory over death shines out in Mary, assumed into Heaven at the end of her earthly life. For us, the event of the Assumption is a horizon, a goal, a sign of hope. In the Assumption, we see the triumph of Christ, but there still are battles left for him to fight in all the battles that rage within our own troubled souls. In the midst of these battles, I know that Christ the Lord still fights for us, and that Our Lady of the Assumption, the Lady of Victory is at His side.